Aero engine turbine discs are most critical parts. Material inhomogeneities can cause disc fractures during the flight with fatal air disasters, see  for example. Non-destructive testing (NDT) of the discs in various machining steps ranging from forging blank to finished shape are necessary. And, consequently, NDT is performed as well as possible. Conventional NDT methods, however, have unacceptable limits. For example, in conventional disc materials like titanium alloys, hard alpha inclusions can only be detected indirectly by detecting cracks which already have developed from them. This may be too late. Direct detection of such inclusions by ultrasonic techniques fail because the contrast of the impedance is not pronounced enough. Eddy current techniques and segregation etching fail if the inclusions do not extend to the surface. Furthermore, turbine discs which are made from advanced material like UDIMET 720 Li, are to be operated near to their mechanical and temperature limits. Therefore inhomogeneities which can be tolerated using conventional material are inadmissible with such advanced materials. The demand for improved NDT methods is even stronger . For those cases in which the inclusions which are to be detected are ferromagnetic, a solution of the testing problem is now available, see , . Making use of the HMT Magnetomer System, see figure 1, allows for the localization and quantification of ferromagnetic inclusions, for example of a mass of 1 mg in a depth of 70 mm below the surface. The physical principle of magnetic remanence is used. These tests are performed on a routine basis. Critical inclusions, however, may also be non-ferromagnetic. One solution of this testing problem uses the magnetic susceptibility difference between base material and inclusion as well as most sensitive magnetometers . If such non-ferromagnetic inclusions are electrical conductors, which is often the case, another and possibly more sensitive mode of operation seems possible. This is what we call the thermoelectric method. Some tests with this method are described in this SPOT BEAM. A SQUID is an electronic device to measure magnetic fields. It makes use of superconductivity, therefore it has to be cooled with liquid nitrogen during operation. The devices under test, however, may stay at room temperature. SQUIDs are the most sensitive magnetometers which are known. 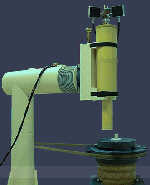 The SQUID-based HMT Magnetometer System is described more detailed in . When performing non-destructive testing, especially for inclusions within aero engine turbine discs and their preforms, four modes of operation should be distinguished. When performing tests in this thermoelectric mode of operation, an appropriate temperature distribution within the device under test is made. Then electrical currents are generated at the boundaries between different metals, that is at the boundaries between base material and inclusion. The currents in turn generate magnetic fields which can be detected by SQUIDs. In the following we shall describe tests on turbine discs using the thermoelectric mode of operation. Tests on two turbine discs made from INCONEL 718 are described which DaimlerChrysler Aerospace MTU-München GmbH had placed at our disposal. MTU had tested them and found segregations by segregation etching. These unused parts had been sorted out by MTU because of material flaws. Figure 2 shows disc #1: a photograph in the lower right corner, an inset showing the test arrangement in the upper right corner, and a measurement plot on the left. The plot gives the amplitude of the magnetic field in arbitrary units versus the rotation angle of the disc on the turntable. Two periods are plotted. The SQUID gradiometer is set to that radius, see inset in upper right corner, at which MTU had made marks to locate two adjacent segregations. The angles of both marks were about 47°. The dominant peak in the magnetic signal exactly coincides with this angle of 47°. The following three figures describe measurements on disc #2. A pair of two nearby segregations were marked at 310° in the lower part of the disc rim as shown in the upper right inset of figure 3. A third segregation was marked at 90o on the upper part. Both locations are rediscovered in the magnetic field plot. The extremum at 310°, however, is much more pronounced than that at 90°. This is due to the radius of the SQUID gradiometer and the details of the temperature distribution. It should be noted that the SQUID gradiometer is above the upper part, and the segregation at 310° is in the lower part. This underlines the sensitivity of the test procedure and shows that the disc itself is quasi-transparent for these kind of measurements. A different temperature distribution and SQUID gradiometer radius is used in figure 4. Under these conditions the segregation at 90° gives a considerable stronger signal than those at 310o. Furthermore, at 43° there is a pronounced extremum. This leads to our conclusion that at 43o there is another segregation, presumably below the surface because it has not been detected by segregation etching. Figure 5, with another SQUID radius and temperature distribution and with the disc turned upside down, gives a strong signal at 197°. This can only be explained by a further segregation inside the material which could not have been detected before. We have commented on only those extrema in figures 2 to 5, which either coincide with marked segregations or with extrema which have pronounced values under certain measurement conditions. The residual structure of the plots, however, shows further ups and downs and to a large extent is also repeatable, see both periods in each plot. This confirms that more inhomogeneities with possibly smaller volume are within the discs. This residual structure is not caused by system noise. The noise of the system is a factor of 1/30 to 1/40 smaller. These measurement show that the SQUID-based thermoelectric method is a very powerful one. It should be stressed that it is able to detect segregations which are located under the surface and that non-magnetic metals like INCONEL 718 are quasi-transparent for this type of tests. The latter statement is proved here by the described tests of turbine discs with a rather small wall thickness. But our additional experience with discs of larger thickness confirm the general validity of this statement. Furthermore, it should be stressed that the thermoelectric test procedure predominantly gives information on material inhomogeneities. Parasitic influence of the device geometry is very small. For example, in the described measurements no influence from the teeth on the periphery has been observed. A feasibility study on the thermoelectric mode of operation of the HMT Magnetometer System has been performed. On the example of aero engine turbine discs made from INCONEL 718, it has been shown in this paper that segregations can even be detected when being located considerably below the device surface. Up to now such problems were unsolved in the test of aero engine turbine discs. Because they are most critical parts, this test procedure may help to increase air safety considerably. The HMT Magnetometer System has been used to test for segregations not only within at INCONEL 718 material but also in Waspalloy, titanium alloy with a-b segregation, and UDIMET 720 Li. All these trials were successful. This report describes an extremely successful feasibility study. A further development of the method, however, is necessary to develop it into a routine test procedure. The authors highly appreciate the support during these investigations given by Dipl.-Ing. Wolf Dieter Feist from DaimlerChrysler Aerospace MTU-München GmbH.